Elections are decided by who votes -- and increasingly, in America, by who cannot. Barriers to voting participation skew policy outcomes and elections to the right in the United States. One of the most racially discriminatory of these barriers is felon disenfranchisement. Nearly 6 million Americans are disenfranchised due to felonies. This may seem like a small share of the population, but the concentration of disenfranchisement in some states makes it enough to shift elections. In six Southern states -- Alabama, Florida, Kentucky, Mississippi, Tennessee and Virginia -- more than 7 percent of the adult population is disenfranchised. Unsurprisingly, given the racial biases in the criminal justice system, the burden does not fall equally across racial groups. In the most definitive research, Christopher Uggen, Sarah Shannon and Jeff Manza find that “one of every 13 African-Americans of voting age is disenfranchised, a rate more than four times greater than non-African Americans.” New research suggests this is skewing democracy. In a new study, three economists find that felon disenfranchisement has a significant impact on congressional elections -- enough to swing between one and four House seats in favor of Republicans in the 1998, 2000, 2002, 2006, 2008, 2010 and 2012 elections (the numbers vary based on the model and election). The authors, oddly, argue that because these elections would not have changed which party held the House majority, disenfranchisement doesn’t matter for aggregate political outcomes. But research suggests that close elections have long-term impacts because incumbents tend to be re-elected. In addition, even seemingly modest things like vote margin can affect how elected officials vote. At a time when laws are passed on razor-thin margins, every House seat matters. 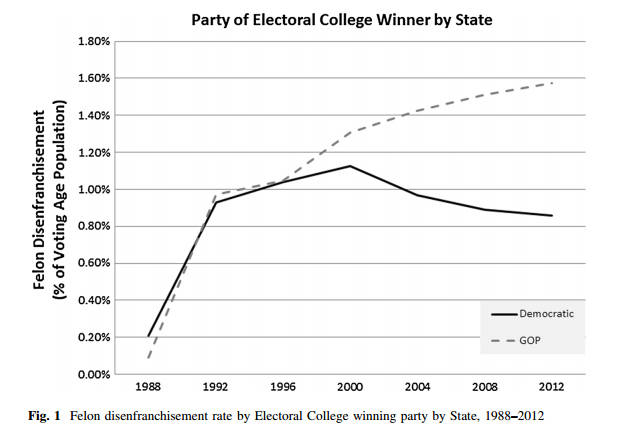 Another study on felon disenfranchisement finds a key divergence in 2000. Author Edward Burmila finds: “Disenfranchisement rates no longer bear a significant relationship to crime rates, and states won by Republicans have both lower overall turnout and higher levels of ineligible felons in the voting-age population.” His work does not speak to causality, but the results are jarring: In states Republicans are winning, an increasingly large share of the population are disenfranchised (see chart below). Burmila's work suggests that, much like voter ID laws, felon disenfranchisement is seen by Republicans as a way to create a more favorable electorate with little or no public backlash. Recognizing that cuts to early voting are unpopular, the GOP has increasingly pursued strategies intended to narrowly target low-income people and people of color. The implications are dire, not just for democracy, but for society. Research shows that voting helps ease transition back into communities for citizens returning from incarceration. By depressing turnout in poor communities, felon disenfranchisement can influence the way public spending is distributed. Another recent study finds that allowing immigrants to have voting rights reduces the chances they will commit crimes. More can be done to increase turnout among formerly incarcerated individuals who are eligible to vote. Outreach campaigns have proven successful at increasing voter participation among formerly incarcerated people. In Iowa, a 2005 executive order automatically restored rights for those leaving prison (rather than requiring individuals to submit a request to the governor). Only individuals released after July 4, 2005 received a notice, however. A study finds that individuals released before that date had a turnout rate 5 to 10 points lower than those who were released later and notified of their restored rights. Bolstering turnout among returning citizens and reducing barriers for disenfranchised individuals would lead to a more equal society because skewed turnout leads to skewed policy. In a recent study, political scientists Patrick Flavin and Julie Nelson find that districts with higher turnout have better representation in Congress. They find that this relationship is conditioned by partisanship, however: Democrats are responsive to higher turnout, but not Republicans. Research has linked high inequality in voter turnout to higher income inequality. Health bias in voter turnout (caused by onerous barriers to registration and voting) means the policy often ignores the needs of individuals with poor health. A recent study of Medicaid expansion in Alabama found that a third of the individuals who could benefit from Medicaid were barred from voting due to registration barriers. Many others could not vote because of felony convictions. Though Democrats are more favorable to voting rights than Republicans, they are far from perfect. New York, a deep blue state, still bars voting while on parole, disenfranchising 44,000 people. In Delaware, Democrats have yet to use their control of the governorship and both legislative chambers to expand voting for people in prison or on parole and probation (some people are permanently disenfranchised). The result is that 5 percent of African-Americans in Delaware are disenfranchised, compared to 1 percent of the rest of the population. Disenfranchisement distorts democracy and increases inequality. Progressives should organize around ending felon disenfranchisement in both blue and red states. At the same time, progressives should work to ensure that returning citizens who are eligible to vote are aware of their rights and are registered to vote. In many cases, formerly incarcerated individuals are unaware of their rights. Increasing turnout has the potential to meaningfully influence political outcomes.